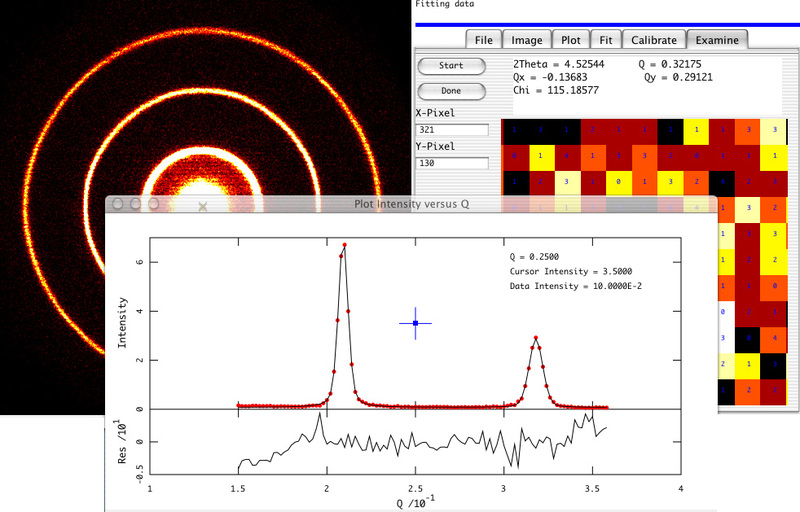 Datasqueeze 3.0 is a graphical interface for analyzing data from two-dimensional x-ray diffraction detectors (CCD, wire, image plate). The interface is simple and intuitive, and the program is easy to use even for those new to x-ray diffraction (XRD) analysis. Basic features include image centering and calibration, radial and pole plots, and least squares fits to a wide variety of commonly used functions. More advanced features are described here. Almost all features can be accessed via either an intuitive graphical interface or a scripted, or "batch" mode. Datasqueeze is particularly useful for the analysis of powder diffraction data, diffuse scattering from polymers or liquid crystals, or small-angle scattering (SAXS) from colloids, polymers, gels, or solutions. Effective February 2018, Datasqueeze has moved from being a a commercial product to freeware. See the Get Key page for more information. Improved support for devices with high pixel resolution such as tablet PC's. Fraser correction for fiber diffraction patterns. Polar, or "unwrapped" false color images. Autoindexing of powder diffraction patterns. Datasqueeze runs on Windows (all recent versions), Macintosh OS X, or Linux. The full-featured version is available as a 10-day free trial download.